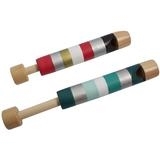 This smartly striped wood slide whistle is a wonderful toy, stocking stuffer or party favor. It comes in assorted colors, please allow us to choose for you. Size: 1"Dia x 6.5"H. For all ages.